The words “it’s over” pierced my heart. I sat stunned. Thoughts racing through my mind. Over? We are married, we have children. Over? How can it be over? God is going to fix this, we need to go to counseling. Over? As the moments passed by, the family I dreamed about my entire life went up in smoke. In an instant, the overwhelming weight of this fallen world crushed me. Never before had I stared evil in the face and felt its unshakeable darkness. As the days, weeks, and months unfolded, the mess grew. I was cut off from all money, had other women sleeping in my bed, had insane rumors spread all over town about me, my belongings trashed, STD tests were done, court dates, life-threatening health complications with my newborn, and a custody battle. I have never been back home. I had to watch on social media as other women took pictures with my husband, in my home, using my belongings and there was nothing I could do about it. I share this with you not to gain sympathy, but to build a bridge into your suffering—so I can truthfully say I know what it is like to suffer. I know what it is like to feel like you might die from a broken heart. I know what it is like to feel like life is not worth living. So if you are reading this today from a place of turmoil, I might not be walking in exactly your shoes, but I understand your agony. Although I am not yet on the other side, I can sit here and tell you that through it all, the light shines on. In our suffering, we gain the rare privilege to have a front-row seat to the fulfillment of God’s promises. It brings us into a place where we get to be a part of scripture coming alive. My prayer is that through this post you will experience the God of hope and that he will fill you with all joy and peace as you trust in him. I do not have all the answers, but my experience with the Lord has taught me that he will waste nothing. It is in our suffering that he comforts us so that we can comfort others. I believe with my whole heart that during suffering you can still have joy. The saying “we are never given more than we can bear” is not true. If we could bear the brokenness of this world we wouldn’t need a savior. But with Christ, this very broken, pain-filled road can transform something inside of us that otherwise could never have existed. It is in our darkest hours that God’s greatest miracles can be birthed. It is only in his presence that we can find rest for our weary souls. I love how Psalm 91 says “whoever dwells.” You cannot have the promise of rest without the pursuit of the Father. 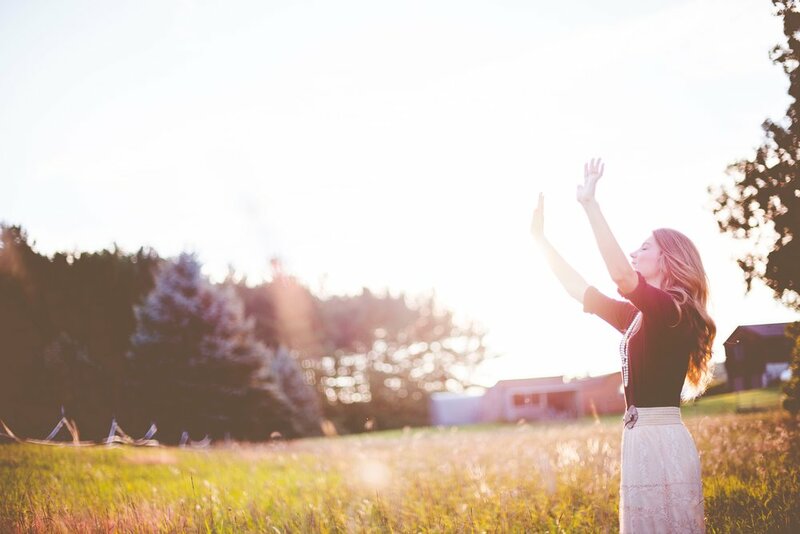 When the darkness starts suffocating me, and the tailspin of all-consuming thoughts start engulfing me in a black hole, I must intentionally stop, put on worship music, and start praying. God commands us to take every thought captive and make it obedient to Christ (2 Corinthians 10:5.) He protects us from the devil's schemes by protecting the first thing the devil attacks: our minds. Joyce Meyer says: “Where the mind goes the man follows.” Satan will do everything he can to keep you from dwelling in God’s presence. As believers, we need to be diligent in the pursuit of our Heavenly Father's rest. I am not strong enough to be left to my own thoughts. Even after almost 2 years, I cannot bring my walls down, even for a day. I must consume myself with my Heavenly Father, moment by moment. I encourage you to write out scripture and memorize it, play worship music, write out prayers, dig into the Word, listen to sermons, get some sleep, and carve out time to sit and rest in the shadow of the Almighty. I am not thankful for my situation. I don’t believe Paul, in this verse, is commanding me to be thankful for my situation. But, we can always be thankful despite our situation. Instead of thinking “I know God is my provider, but I have no money,” we can say “I know I have no money, but God is my provider and I will trust him.” What you are facing might be more than you can bear, but God is bigger than all of it. When we give thanks in the storm, we turn our pain to praise. We take our eyes off our mess and onto the Messiah. In the blink of an eye, I became a charity case. I was pregnant with no job or career. And I had two small mouths to feed. We had no belongings, and we no longer had a home. I was completely humbled and brought to tears by the sheer generosity of people. My parents opened their home to us, people donated everything we needed, and we were provided for financially. God says he will supply all our needs and I have been a living testimony to that. In my poorest days, I was so rich. Because I chose to look at what I did have, not what I didn’t have, I learned to trust God with everything. I encourage you to write a list of all the things in your life that you are thankful for and spend time praising God for those things. Then, go out and serve someone else: make a meal for a family, babysit someone’s children so they can go out on a date, give financially to a need, volunteer your time. Watch what God will do in and through you as you praise him in this storm. Nobody likes the refiner's fire. Nobody likes to be pruned. But God loves us too much to allow our suffering to be for nothing. We are called to become more like Christ. Jesus left the grave behind so that we can too. We need to stop paying for things that Jesus already died for. God wants you to live in freedom, he wants our mess to become a message. We are given a choice in our suffering: we can become bitter or better. The choice is ultimately ours. You, my friend, are not a victim, you are a child of God. The Lord has a great work to do in and through you. When we work with Christ and let the Holy Spirit change the hard parts of us, we can then be free of what Satan meant for evil. No matter how great our suffering, God is greater. With some hard work and the Holy Spirit, we can be made into a new creation. God has a great plan for your life, one where the glory of God will reign. I truly believe the best is yet to come. I encourage you to speak to a Christian counselor, seek a mentor in your church, or join Freedom Session. Do whatever you need to do to really process your reality and give it to God. Work through your feelings, and let God cut off all that is holding you back. Sweet Daughter of the King, God sees you. He not only sees you, he feels every ounce of your suffering. He walks with you and won’t forsake you. So I say to you: YOU are not alone. This life is not easy; it’s excruciating at times, but through it all, it truly can be well. I pray that the Lord spoke to you through these words and that your trust is strengthened, awakened, and purified. You are in good hands! When you dwell in the presence of God, give thanks, and let the fire do its work, you can truly find joy in your suffering.